If you are concerned about the ingredients in commercial foods or you are simply looking for another way to spoil your pup, consider making your own Fido food. You can customize the recipe to match your pet’s preferences. Oats and rice are good ingredients to use for the base of the recipe; add fruits, vegetables and meats to provide a variety of tastes and textures while simultaneously improving the nutritional value of the meal. Always consult your vet before making any changes to your dog's diet. 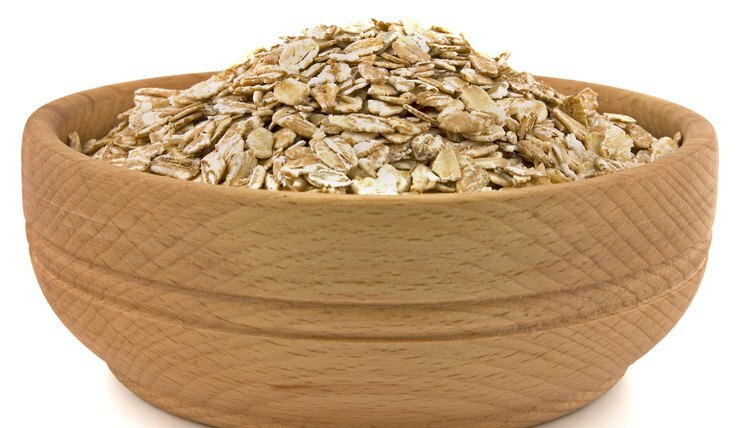 Oatmeal contains substantial amounts of fiber, making it a good dietary item for dogs with digestive difficulties. Additionally, it is a great alternative staple for dogs allergic to wheat or corn. Brown rice is another high-fiber ingredient, which helps keep your dog’s belly full without raising the calories very much. Some dogs are reluctant to consume brown rice, so you may want to add just a little bit to the first few meals and gradually increase the amount you include. Prepare your dog’s new food by first boiling 2 cups of water in a medium saucepan. Add 1 cup of raw whole oats, cover the saucepan and cook for two minutes. Turn off the heat and allow the oats to stand for about 10 minutes before adding 3 eggs, 1 cup of shredded carrots, a half-cup of cooked brown rice, a half-cup of cottage cheese, a teaspoon of bone meal and a teaspoon of olive oil. Mix all the ingredients thoroughly with a wooden spoon. If you like, you can include the eggshells in the mix, but only after you've cooked them in a 350-degree oven for 12 minutes. While rice and oats are fine dietary items for your pup, dogs are technically carnivores whose diet should include plenty of animal-derived protein sources. Lamb, salmon, chicken, turkey and beef are all acceptable choices; cook them thoroughly and mix them into the rest of the food. Additionally, you can include other vegetables in the recipe, including broccoli, leafy greens, beets, pumpkin or green beans. Your dog may also enjoy small pieces of apple, a few teaspoons of peanut butter or small blocks of cheddar cheese mixed into the food. While these foods are all considered to be safe by most authorities, run your intended list of ingredients by your vet to ensure they will not sicken your dog. Be careful to avoid adding any toxic or dangerous items to your dog’s food. Do not include onions, grapes, chocolate, raisins or any significant amount of garlic in the recipe. Abstain from adding artificial sweeteners or sugar to the recipe. If you are not certain an ingredient is safe to include, leave it out until verifying that it is safe with your veterinarian. In an article posted on DogChannel.com, veterinarian William Pollak recommends providing your dog with about 1 cup of food for every 35 pounds of body weight, each day. For example, if you have a 70-pound dog, he requires 2 cups of this food each day. Store the food in a sealed container, and store it in the refrigerator, where it will keep for three to four days.